ELKANAH went up to Shiloh yearly to offer sacrifice and when Samuel was old enough, Hannah went with her husband and took her little boy with her. They came to Eli the high I high priest, and Hannah said: "Oh, my Lord, I am the woman that stood by thee here praying. For this child I prayed; and the Lord bath given me my petition. Therefore also have I given him to the Lord." Then she left Samuel with Eli. 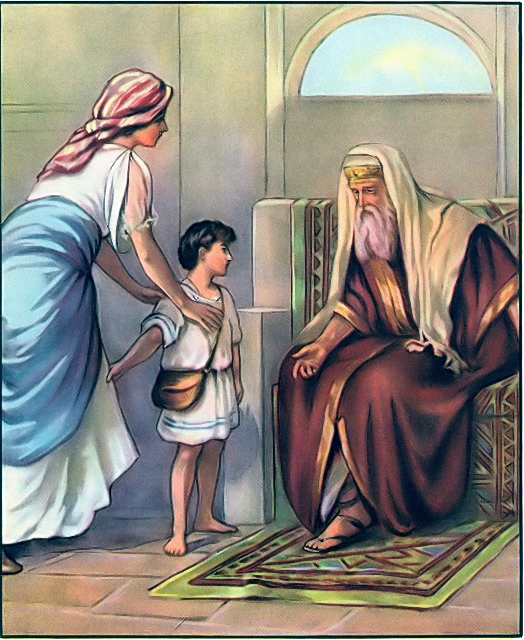 Samuel assisted Eli in the Tabernacle service, and wore a linen ephod like a priest. His mother came yearly to see him, when she accompanied Elkanah to the sacrifice at Shiloh, and each time brought with her a little coat, which she bad made for her son. Eli was an old man, who bad two wicked sons. These he bad not restrained as he should have done. So God was displeased with him and them on account of their sins. One night, while the lamp in the Tabernacle was burning, and Eli was resting, Samuel was sleeping. A voice came to him calling, "Samuel!" He rose, and ran to Eli saying, "Here am I." But Eli had not called, so Samuel lay down again. A second time the same voice called, "Samuel!" He went to Eli and said, "Here am I; for thou didst call me." But Eli replied, "I called not, my son; lie down again." 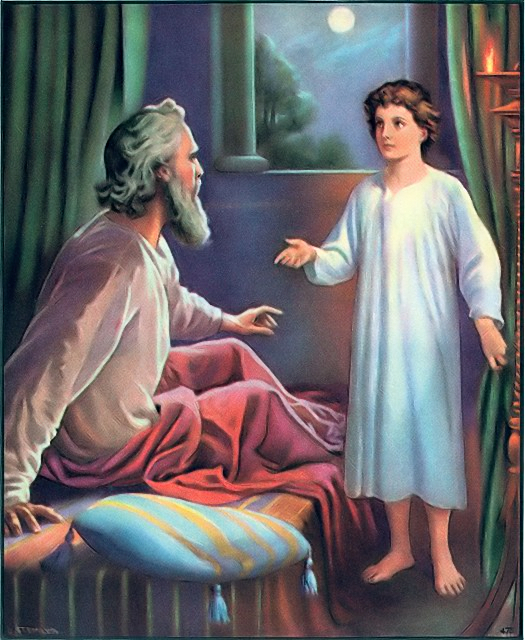 The call was repeated a third time; then Eli told Samuel it was the Lord who called him; and bade him answer if the voice came again," Speak, Lord, for thy servant heareth." Again God called, and Samuel answered as Eli had commanded him. Then God told Samuel what terrible things should befall Eli and his sons through through their wickedness.